The Plymouth Court established Adamsville as part of "Sakonnet" in the seventeenth century. The settlement adopted the name "Little Compton" in 1683 (check). Although Adamsville village had no official name at that time, many people referred to it as "Taber's Mills." What is now Westport, Massachusetts was also called "Dartmouth" during this period. The original border between Little Compton and Dartmouth was the west bank of what is known today as the Westport River. That approximate location is marked by this pin. At that time, all of Little Compton, including Adamsville, was part of first Plymouth Colony and then later Massachusetts Bay Colony. In 1747, by decree of King George II, and to the delight of Rhode Islanders, Little Compton, Tiverton and three other Massachusetts border towns officially became part of Rhode Island. The king had the RI/MA border redrawn as a series of straight lines connecting several points exactly three miles in from the eastern bank of the Sakonnet River. This new, straight border ignored the natural contours of the Westport River and split Adamsville in two. The grist mill that was the catalyst for the formation of the village was now in a different state. Today, the Adamsville/Westport border, established in 1747 by those straight lines, can be found in the middle of the dam (road) between Gray's Grist Mill and the pond. It is marked by a granite post. 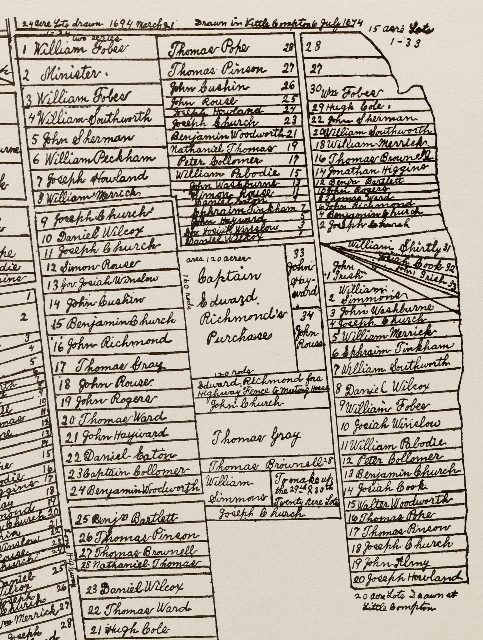 17th Century Proprietor's Map : This seventeenth-century map shows the allocation of land to the original proprietors of the Adamsville area. The Westport River, once known as the Acoaxet River, originally formed the eastern boundary of Adamsville. When the border between Rhode Island and Massachusetts changed in the eighteenth century, some of the property lots were split so that they were a part of both states. 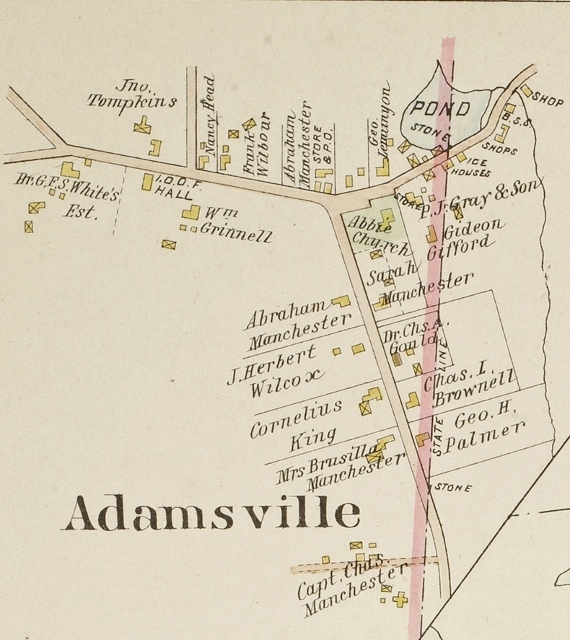 1895 Map of Adamsville : This map, taken from an 1895 atlas, shows the village of Adamsville, with the current RI/MA border depicted by the pink line. Note the Westport River, along the right edge of the photo, that once marked the original boundary between Rhode Island and Massachusetts. Marjory O'Toole, “Original Adamsville Border,” Rhode Tour, accessed April 21, 2019, http://rhodetour.org/items/show/112.